I knew Javier as the guy who escaped Bill Mazeroski's shadow--Pittsburgh signed and traded Julian before he ever appeared in a Pirate uniform--but am surprised how underwhelming his numbers look on paper. It sort of goes without saying that 2Bs couldn't hit in that pitching-heavy era; his "peak" with the stick only broke average (100 OPS+) twice. He did finish high in range measurements for the early 60s, but lost a step by 1965 without reducing his total errors, so rates below-average defensively for his career. Career numbers be damned, Topps published this series of playing tips on Bazooka gum boxes following the St. Louis title year, so Javier got their nod at second base. Each of the set's 15 panels shows a tight portrait and illustrated game situations, which I can easily imagine kids miming in backyards everywhere. The full checklist includes six HOFers and two Maury Wills, once each for his small ball skills. 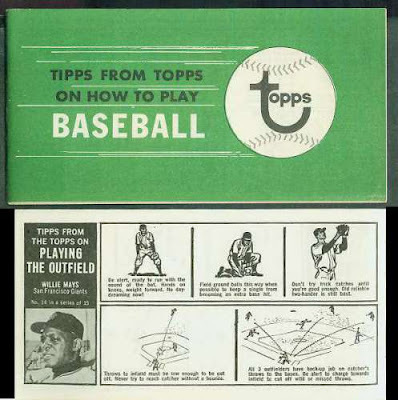 Topps also produced a paper booklet that collects all 15 panels into one product and made it available as a promo item for young collectors. The Topps Archives found advertising connections to both MacGregor clothiers and Boys Life magazine. UPDATE: Looks like PSA's willing to grade the trimmed player photo (H/C = "hand cut"). Ugh. Value: Bazooka panels of lesser-known players cost $10-20, thanks to the set's rarity. HOFers like Mays and Yaz run two or three times that. Fakes / reprints: Haven't seen any in the marketplace, though Topps reused this "Tipps" concept in at least one other set without the inset player photos.